By now you should, as a subscriber, have received the latest issue of Odonatologica as well as the latest Notulae. Unfortunately the application we use for locking downloads of material available only for subscribers is still not updated to the latest WordPress version. This means that you can not access the latest volumes through our website. If you are a subscriber and need any of the locked files, please contact Magnus. Click on the picture below to enlarge it to see the contents. The abstracts can be found here. The latest Notulae abstracts are to be found here. 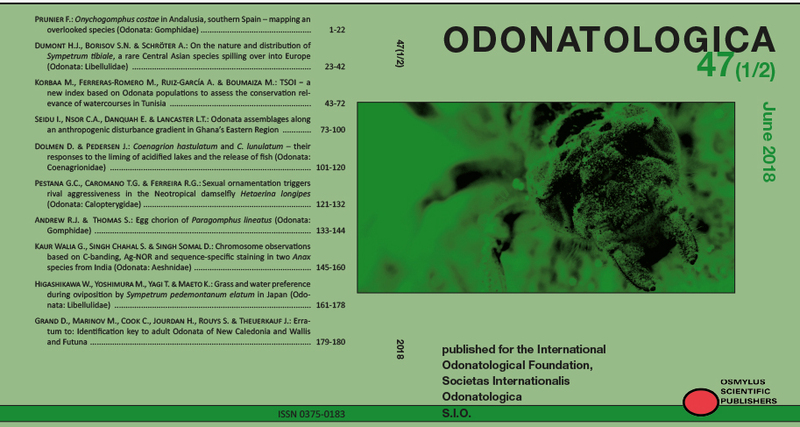 Available for download for free are however the volumes of Odonatologica from the beginning all the way back from 1972 and up to 2010, and Notulae from 1978 to 2010. You find the links to these issues of Odonatologica HERE and of Notulae HERE.